Who doesn’t love a spider plant? 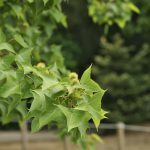 These charming little plants are easy to grow and produce “spiderettes” off the ends of their stems. These babies can be divided from the parent plant and grown as separate plants. Can you grow spider plants in water? Plants need certain nutrients to grow and thrive and can’t be sustained in water long term unless you are using a hydroponic solution. However, you can root the little plantlets and transfer them to soil once the root system is vigorous. Many houseplants are easy to grow in water for a period of time, such as Pothos and spider plants, Taking cuttings or offsets is an easy way to propagate a favorite plant. These cuttings root quickly in just a glass of water. Once rooting is established, the new plant needs nutrients for future development. Plain old water is unlikely to sustain the cutting for very long. Key nutrients can be derived from fertilizer; however, a risk of root burn from built up salts is a potential result. Growing a spider plant in water is a first step to starting a new plant but not a sustainable system. Spider plants produce little tufted growths at the end of their stems. These can be taken off the main plant and allowed to grow roots as separate plants. The best way to propagate the plant is to cut the plantlet from the stolon with clean, sharp scissors. Use demineralized water or let your tap water sit for a day before placing the plantlet in the liquid. Fill a jar or glass with this non-chlorinated water and set the cutting into the container with the bulk of its leaves outside the liquid. Place the cutting in indirect light until it has developed roots. This is a fairly quick process. Frequent water changes are essential to good spider plant water cultivation. No fertilizer will be necessary as the little plant develops roots. However, once a good network of roots have formed, the plant will have needs. You may choose to use a liquid fertilizer such as fish food or diluted houseplant food. Feed the cutting every month, but be careful to change the water every week to prevent salt build up. Leaving rooted spider plants in water can be capricious. Without support, the leaves may be submerged in the water, which can rot them. Additionally, the stems will be limp and may not produce more growth. 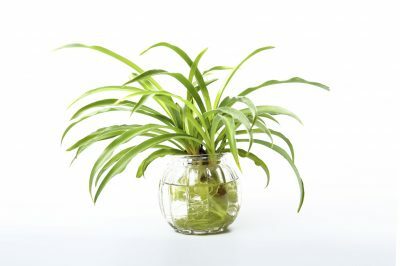 A better option than growing a spider plant in water is to transplant the plantlet into a growing medium of soil. Leaving rooted spider plants in water limits their growth potential. If you are bound and determined to keep your plants suspended in water, use a pair of chopsticks or skewers to help keep the foliage from dangling in the liquid. The only part you want in the water is the root system. Change the water frequently and avoid tap water. Rainwater is a good option to protect sensitive roots from overly acidic or mineralized solutions. Remove the rooted plants and place a thick layer of washed pebbles at the bottom of your container. This will give the roots something to hang onto after you reintroduce the plant to the glass. Continue to fertilize monthly, but flush the system weekly to prevent the water from going stagnant and building up salt. If you see any yellowing, remove the plant, rinse the root system and put the roots into good planting soil. Your plant will be happy you did and the resulting maintenance will be greatly reduced.